This piece has 472 pages, 20 of which are unnumbered. 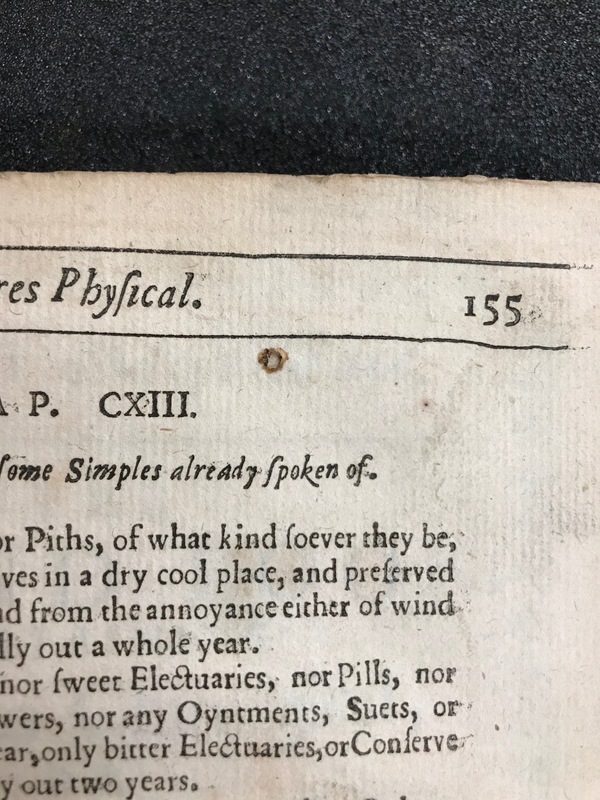 The numbering of the pages goes from 1-416, 367-371, 1-31. Additionally, there are 2 unnumbered folded leaves of plates. Some illustration is included throughout, both within the text and full-page. 20cm (4to). The piece was bound in the late-20th or early-21st century. It has a red calf binding, and has gold tooling on the spine, including horse motifs. 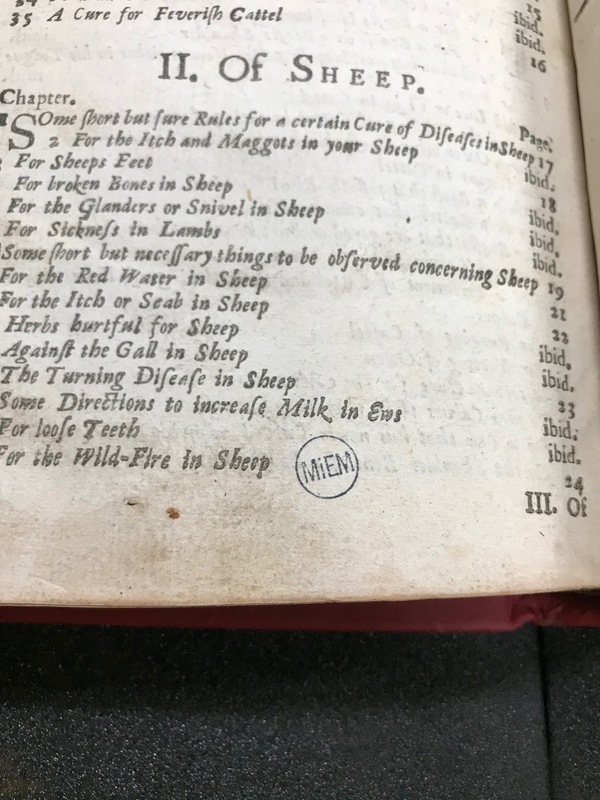 Printed manicules are used throughout the text. There is an additional title page, engraved. 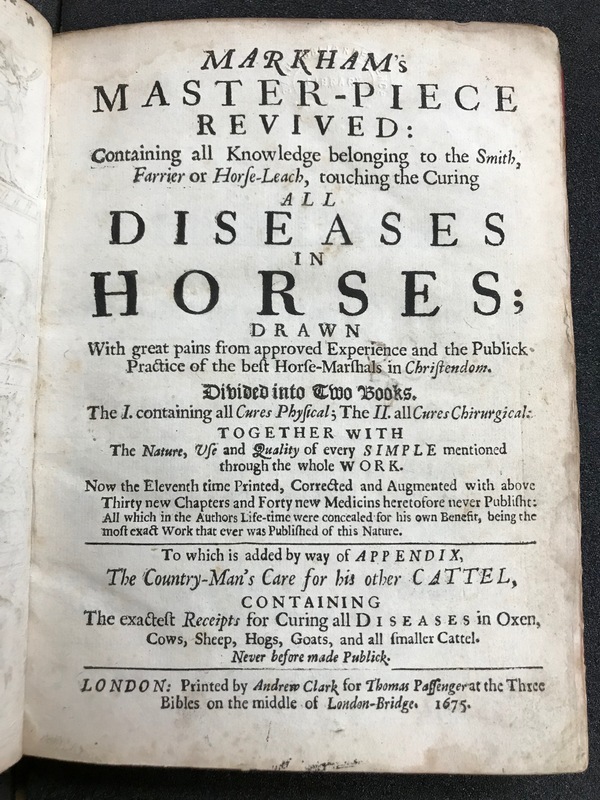 “Markham’s master-piece revived” is a popular 17th-century veterinary text on treating horses. The piece includes a dedication titled “The Epistle Dedicatory” addressed to “The Right Honourable, and my Noble Lord Sir Robert Dormer, Baronet, Baron Dormer of Wing, Viscount Ascot, Earl of Carnarvan, and Master of His Majesties Hawks. 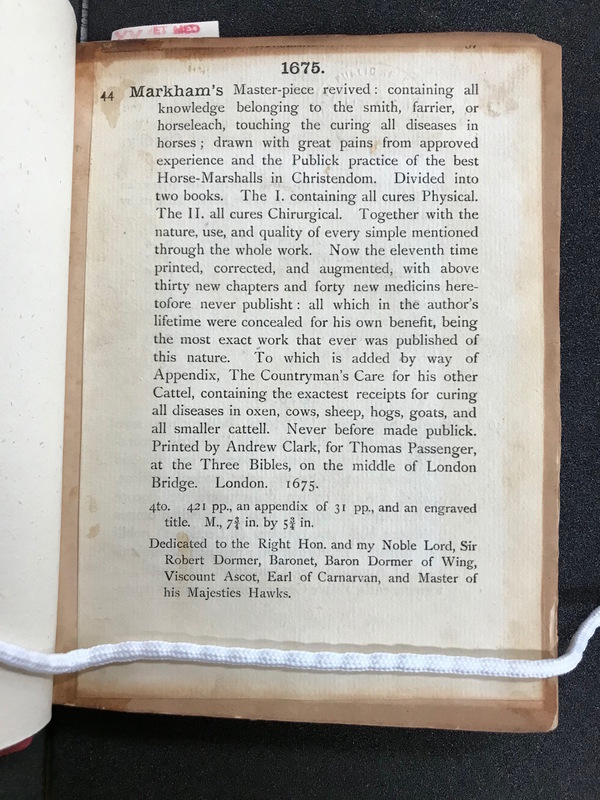 It also includes a note to the reader entitled “An Admonition to the Reader, Which [Markham] would wish him to read, before he peruse the book”. 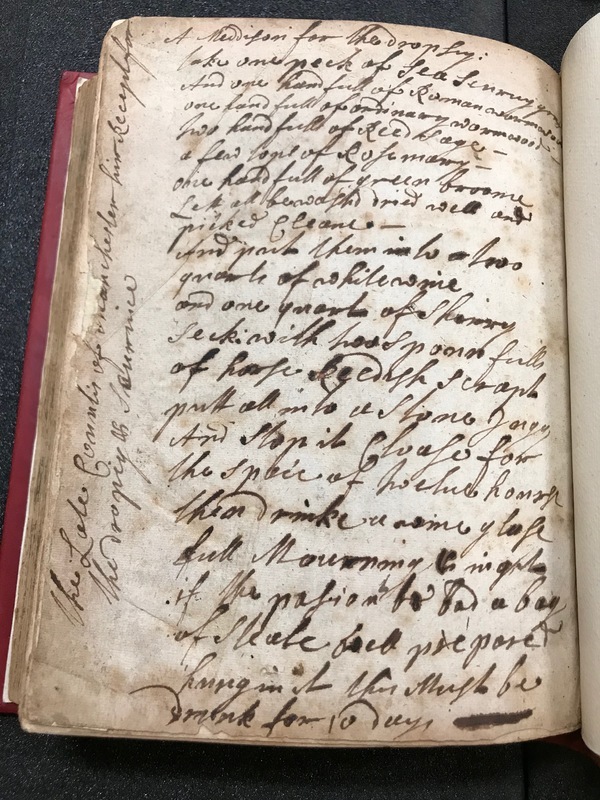 Markham also includes a list of authors from whom anything in this work is collected. 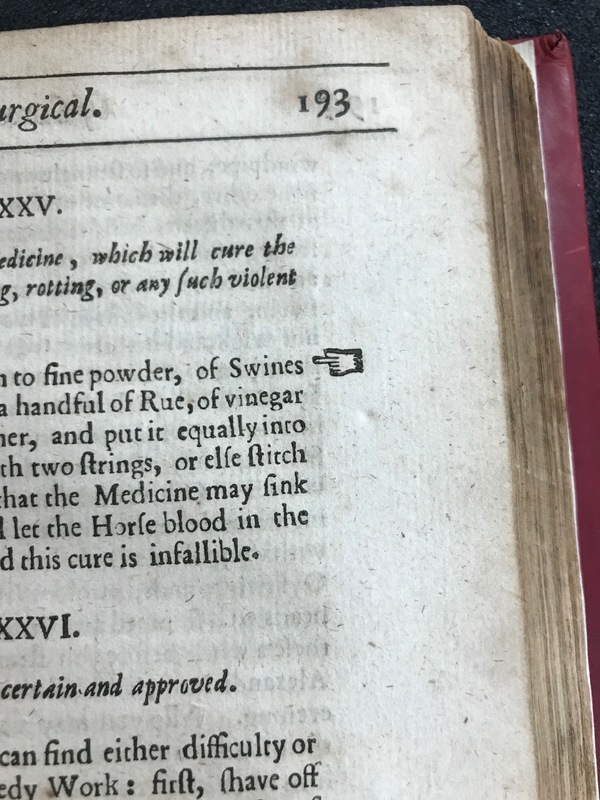 The piece contains two books: the first containing all cures physical, and the second containing all cures chirurgical. 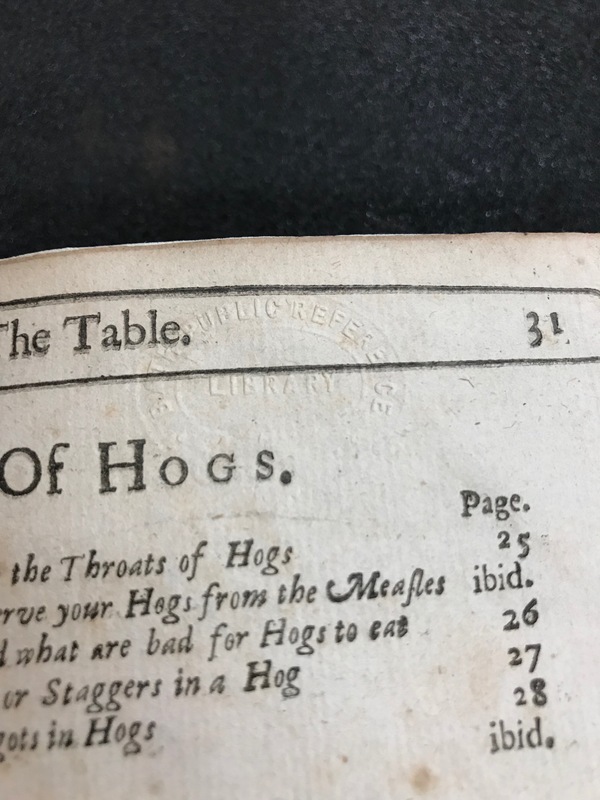 A table for each book is found in the rear of the piece, along with an appendix. The author, Gervase Markham was an English poet and writer. He knew Latin and many modern languages, and was familiar with the arts of forestry and agriculture. He was also a noted horse-breeder, and was said to have imported the first Arabian horse to England. 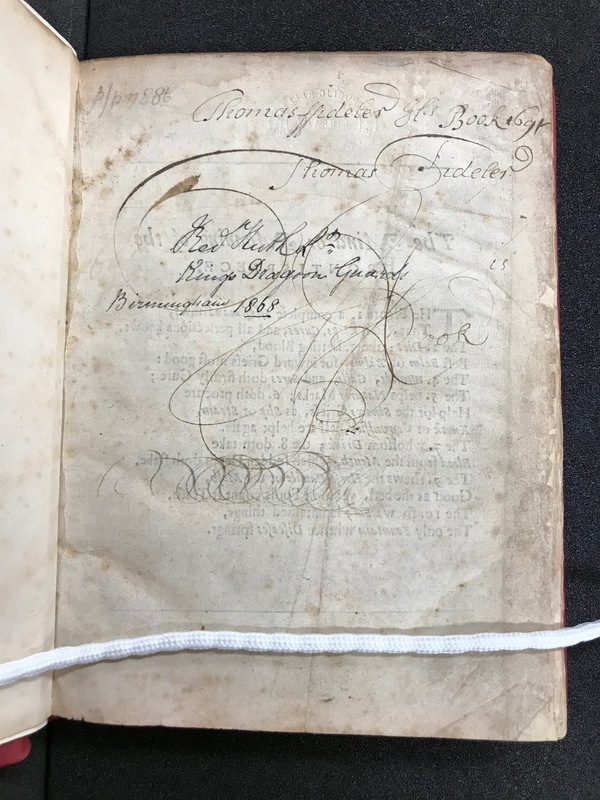 This edition of "Markham's master-piece revived" has passed through many hands throughout its life before ending at MSU, presumably beginning with Thomas Passenger (for whom it was published by Andrew Clark). Other signs of ownership and provenance information will be further discussed below. 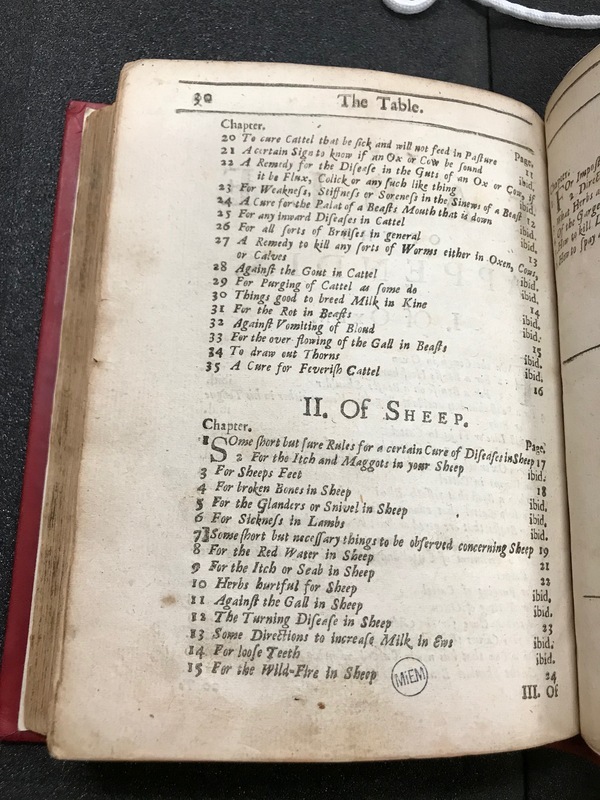 Eventually, the piece was purchased on Septemer 6, 2016, by MSU Library's Head of Special Collections, Patrick Olson, from Classic Rare Books, a rare book vendor in the U.K. The funding for this book came from Betty Koch, in memory of Henry Koch. This piece includes an engraved, additional title page. 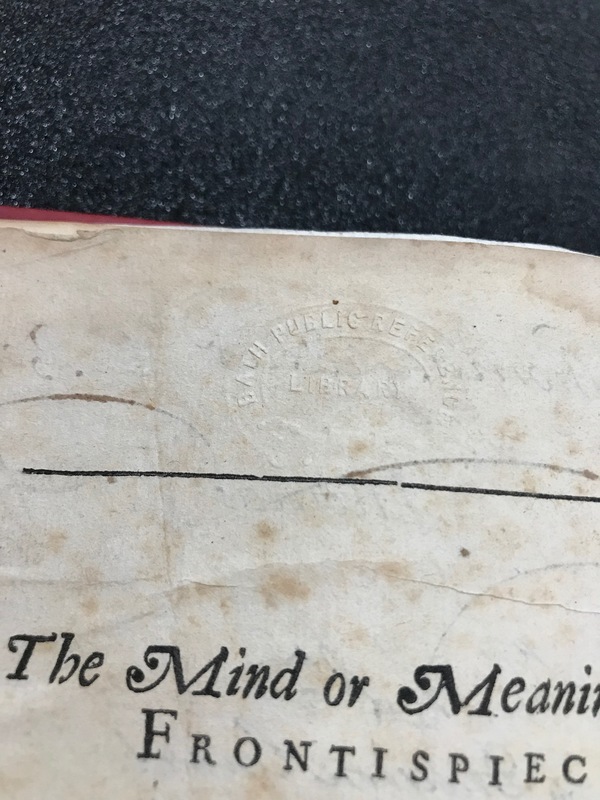 An inscription at the head of this title page reads: "Wm. Eaton Mousley, Etwall Vicarago, 1848." 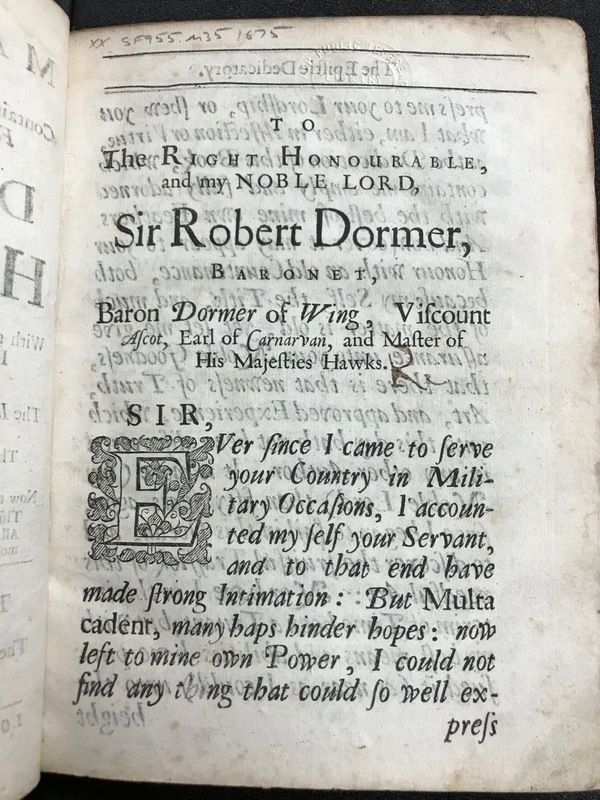 The piece includes a dedication titled “The Epistle Dedicatory” addressed to “The Right Honourable, and my Noble Lord Sir Robert Dormer, Baronet, Baron Dormer of Wing, Viscount Ascot, Earl of Carnarvan, and Master of His Majesties Hawks. 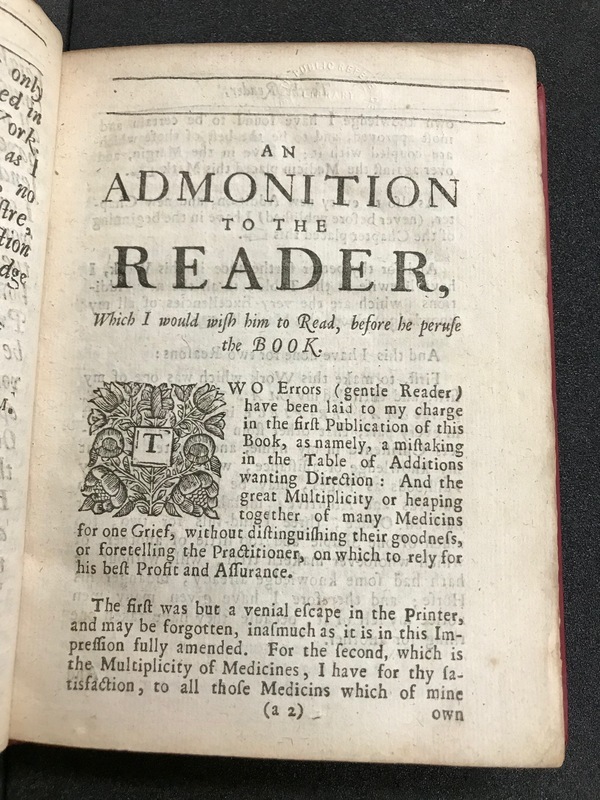 It also includes a note to the reader entitled “An Admonition to the Reader, Which [Markham] would wish him to read, before he peruse the book”. 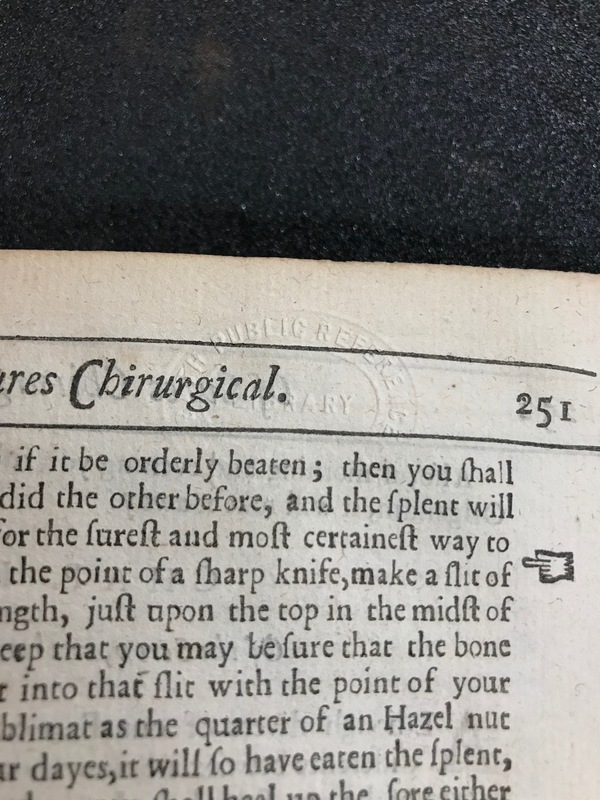 An embossed stamp of the Bath Public Reference Library is found on mulitple pages including on a clipping from Huth Catalogue affixed to a front fly-leaf, on page 251, and on page 31 in the appendix. It is likely that the Bath Public Reference Library had owned and discarded this piece at some point in time. Multiple inscriptions are visible on a front fly-leaf. 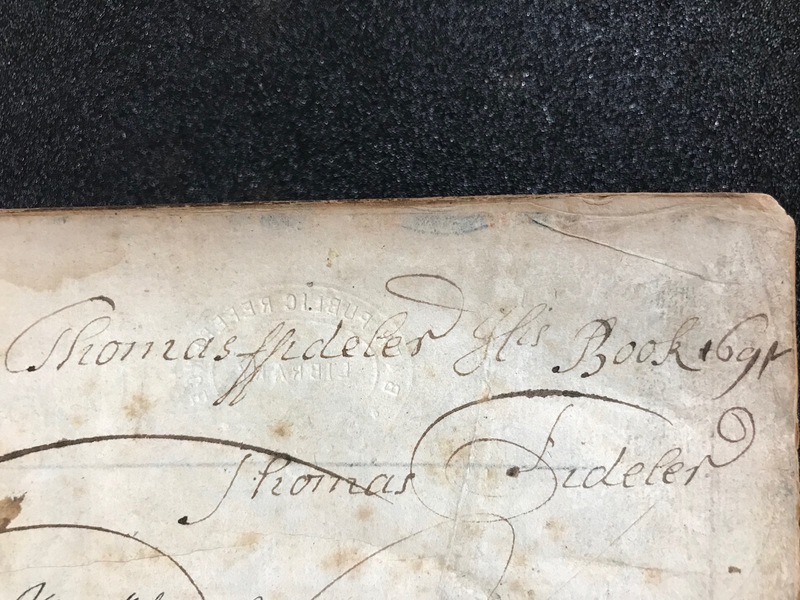 One of these inscriptions found on the top right of the page reads: "Thomas Fideler his book 1691". There is also one in pencil in the top left corner of the page. Another found in the center near the top reads: "[Fr? ]ed Huth Lt., Kings Dragoon Guards, Birmingham 1868". Frederick Henry Huth (1844-1918), was a noted collector and cavalry captain who lived near Bath. 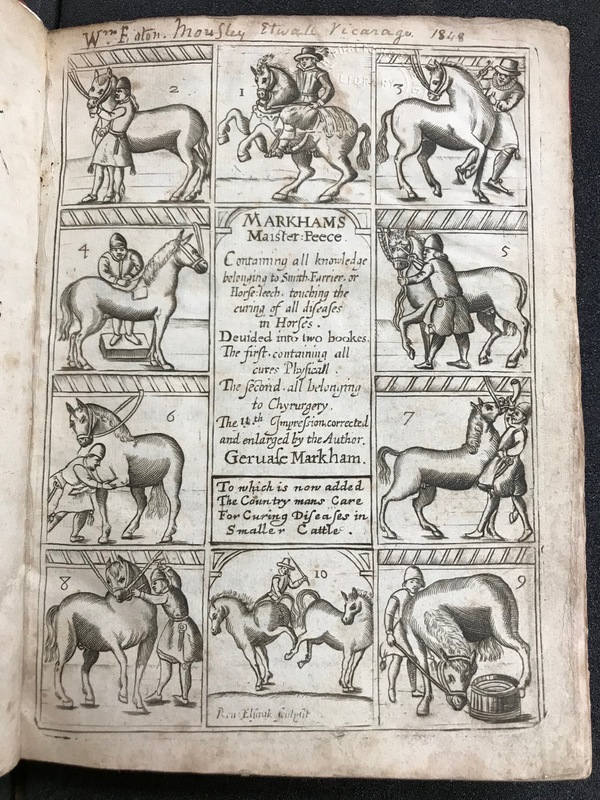 A clipping from his "Works on horsemanship and swordsmanship in the library of F.H. Huth" (Bath: Seers, 1890) has been affixed to the front fly-leaf. An inscription on the backside of a rear fly-leaf reads "The late [Connlis?] 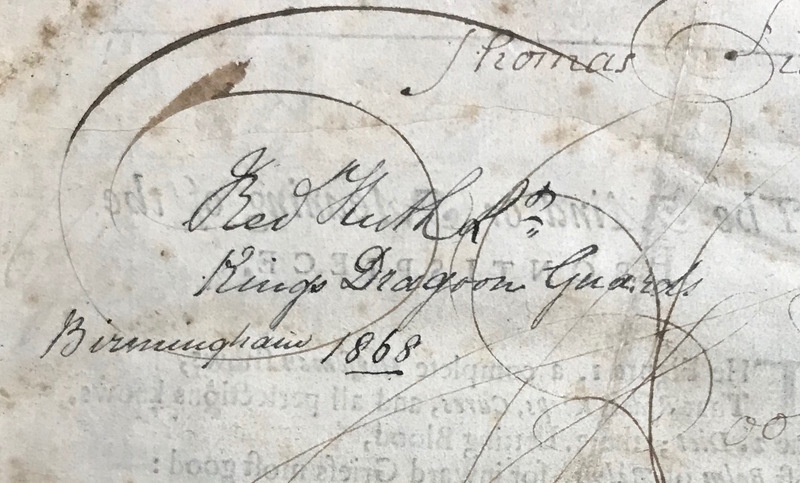 of Manchester his receipt for dropsy & [saurnice?]" 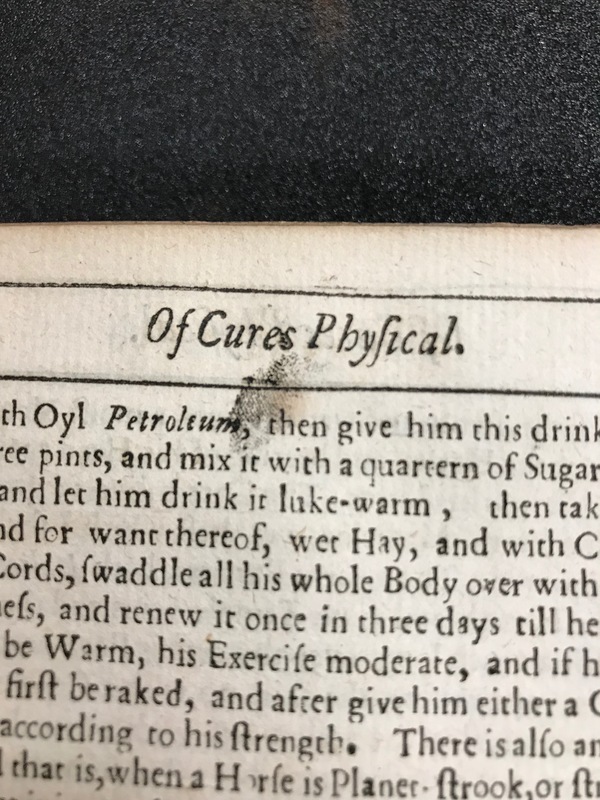 and is followed by a full-page handwritten cure for dropsy. 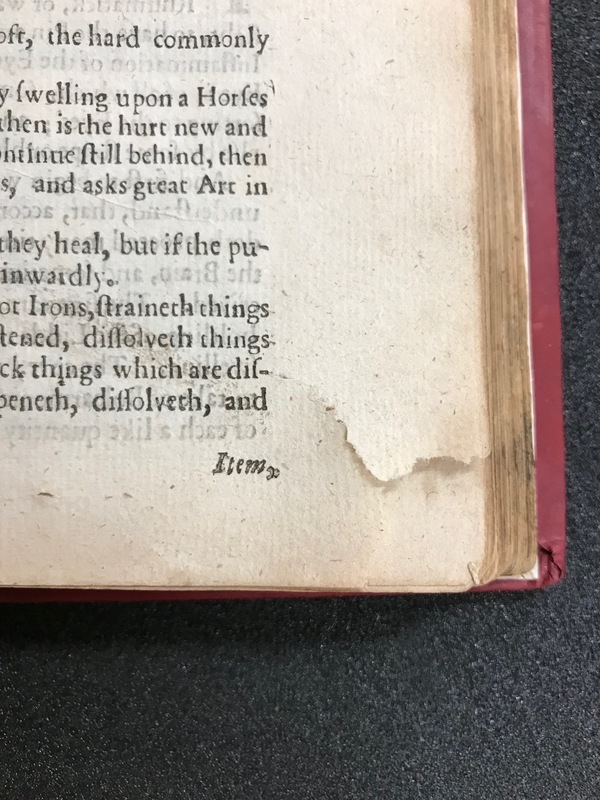 The ink from this inscription has bleed through to the front of the fly-leaf. There is an inky fingerprint on the top of page 45. 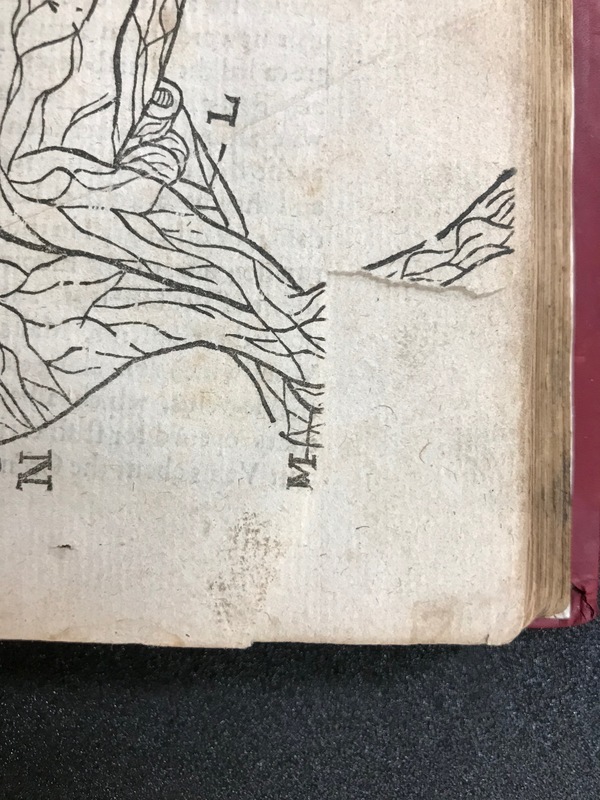 On the backside of the title page, someone had traced some of the capital letters in ink. 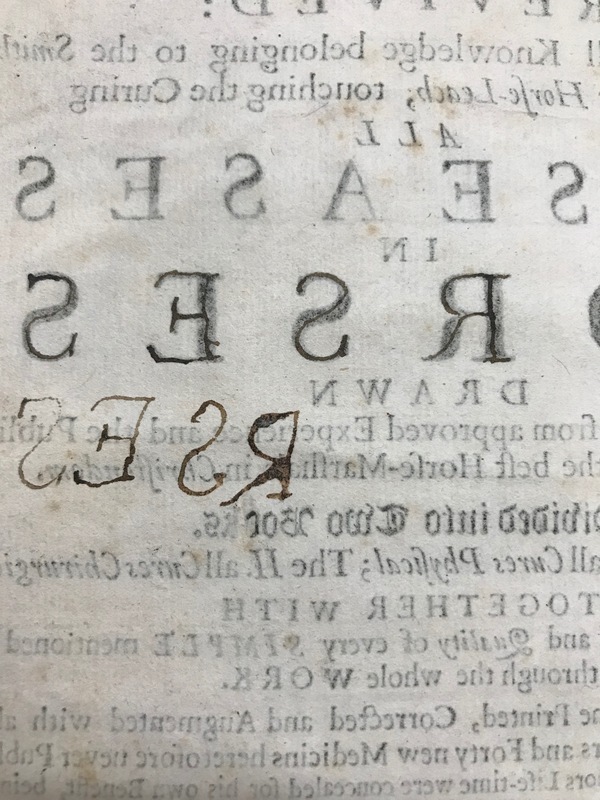 Underneath this tracing, it appears that person had tried copying some of the letters backwards. There is an encircled "MiEM" that appears to be stamped in the Table. This is a stamp from Special Collections at Michigan State Univeristy Libraries. There is a small hole on page 155. The edges around the hole are dark and appears to be caused from a burn, perhaps from an ash that burned through. 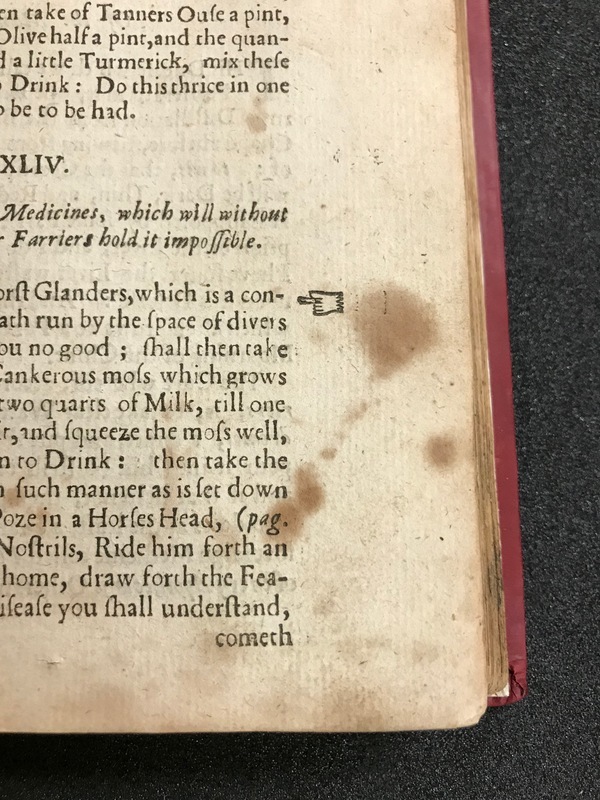 Manicules are printed throughout the book. Here we see a few examples. 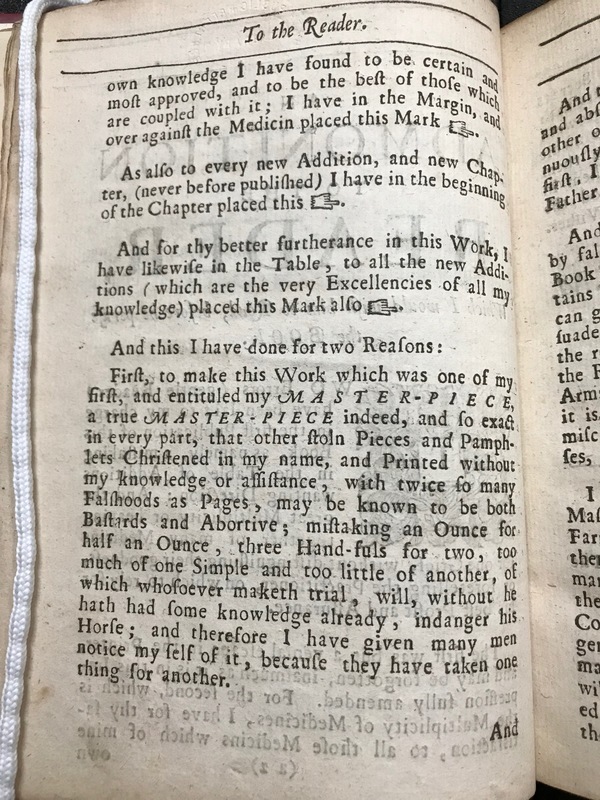 In the beginning of the piece, Markham addresses the reader and discusses his reasoning for using the manicule. 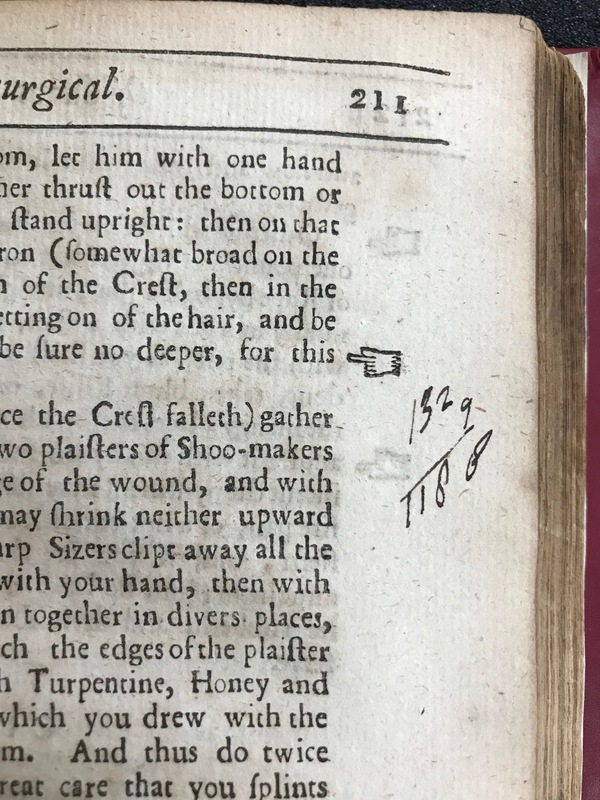 Additionally, there is staining found on one page, and a marginalia with handwritten numbers near one manicule. 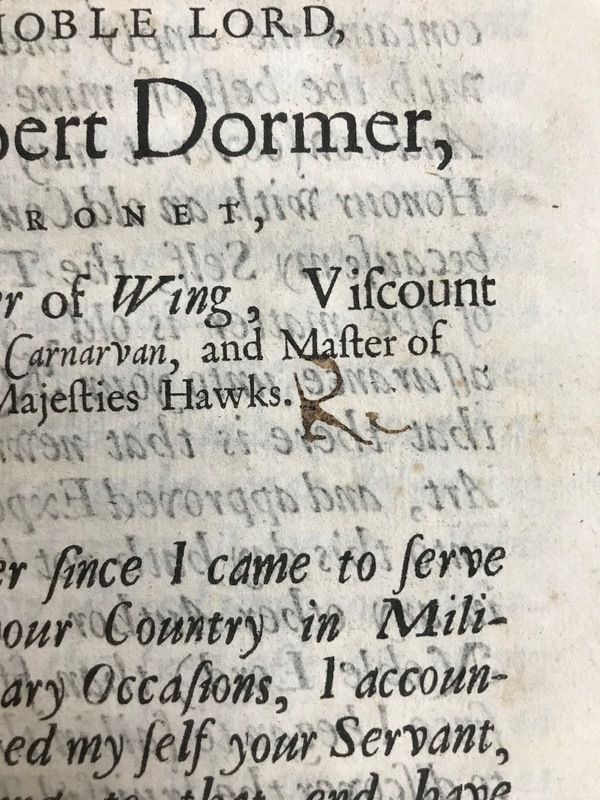 There are some tears on the corners of pages found throughout the piece, typically found on the lower right corner.